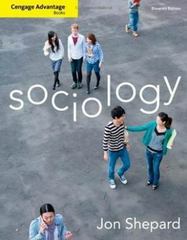 Cengage Advantage Books: Sociology 11 Edition Well respected for its exceptional scholarship, readability, and accessibility, SOCIOLOGY is available at an affordable price! With a dynamic critical-thinking focus and a theoretically balanced presentation, this advantage text is noteworthy for its free built-in student study guide, and its contemporary focus on topics such as hate groups in the U.S., a chapter on the sociology of sports, and the impact of social media. The book tells students just what they need to know, does a nice job defining all the key concepts in the book, and helps them comprehend the reading through the SQ3R approach.